The microscope is a 400 year-old technology long overdue an overhaul. It may be the universal symbol of the scientist, but, as things stand, the microscope is more of a impediment than a gateway to the science lab. White-coated investigators hunch over their devices, engrossed in their own obscure, private worlds. These expensive, fragile contraptions are increasingly rare in our schools. Great swathes of the planet are cut off from the crucial diagnostic power of the microscope. They simply cannot afford to buy or maintain them in their health clinics. A Kickstarter campaign launched late last month champions an implausible-sounding device. For just a dollar's worth of materials – a sheet of paper, a tiny glass lens and a simple LED light circuit – everyone can have their own microscope. 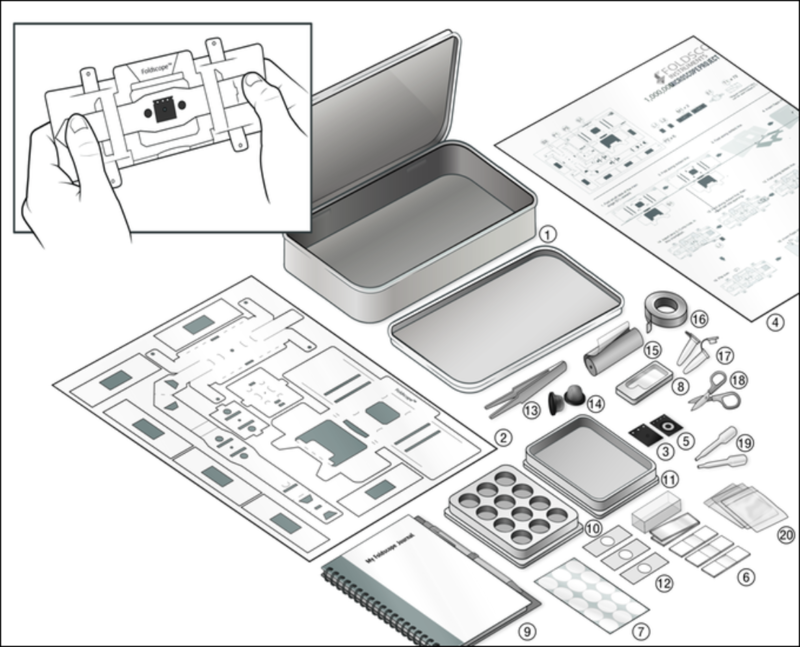 The Foldscope smashed its $50,000 crowdfunding target within hours. The creators aim to flood schools and communities across the planet with a million microscopes during 2017 alone. They want to open the tap on the vast latent reserves of human curiosity. They may wind up tackling some long-standing global health problems too. 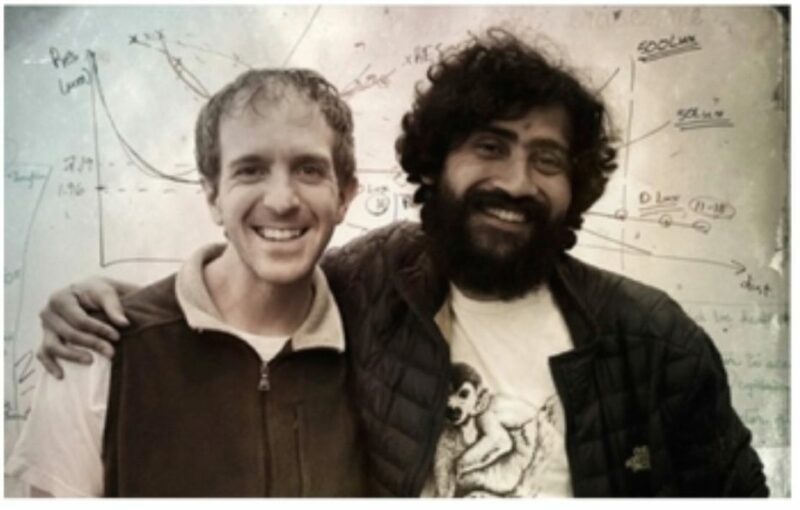 Max Coyle, part of the four-person Foldscope team led by Stanford bioengineering professor Manu Prakash, is critical of the way science is usually taught. "You read all these books and answer all these questions, and only then are you granted the opportunity to make an observation of your own," he says. "We think that should be flipped." Sure enough, the Foldscope is no toy. It's cheap enough to be disposable, but robust enough to survive in school pupils' pockets. And it delivers real insights. The crisp, high-definition images can match the quality of those made by traditional microscopes costing thousands of times more. An ingenious series of origami folds, executed by the user within a few minutes, suspend and protect a powerful, grapeseed-sized lens. A traditional glass slide, or a simple piece of sticky tape, holds a sample below. Adjusting the pressure of your thumbs lets you focus with micron precision. Peering through the pinhole aperture, you enter the microcosmos. The version you'll get through the Kickstarter gives you 140x magnification. That's easily powerful enough to let you see blood cells, pollen and the larger species of bacteria. Clip a camera phone on the front and you can capture your images. Change the illumination and you can project your insights for all to share. "The immediate impact we're seeing is in education and inspiring people to get into science. Particularly in communities where that hasn't been an option," Coyle told me. Pilot testing of Foldscopes in 135 different countries shows the strong appetite for these new microscopes. A community site lets users share their experiences: a Californian hiker marvels at the geometric shapes hidden within a common lichen; an eight-year-old in Tamil Nadu looks at the cells of a fly's wing. Inspired by the movie Frozen, a six-year-old scrutinises microscopic crystals of snow, sugar, sand and salt. People can also donate Foldscopes directly to schools through the Kickstarter campaign. As to his current favourite application, Coyle points me to Cristina Balloffet Carr. Carr, a textile conservator at the Metropolitan Museum in New York, recently jumped at the chance to get her hands on a Foldscope. Carr thinks it will be a quick and powerful way to identify and evaluate fibres of textiles found out in the field. Carr's use of the Foldscope completes a neat loop in the history of microscopy. Antonie van Leeuwenhoek was the first person ever to see microscopic life forms, back in the late 17th century. But he wasn't a biologist, he was a draper. Like Carr, he trained his first microscopes on fabrics. Leeuwenhoek started building his own microscopes, which turned out to be more powerful than anything else around at the time. Conceptually, the Foldscope does away with the bulk and complexity of today's compound microscopes and resurrects Leeuwenhoek's 350-year-old design. Out of sheer inquisitiveness Leeuwenhoek began training his lens on the things he found in the world around him. Everywhere he looked, from dental plaque to pond water, he saw a profusion of 'little animals'. In a famous 1677 letter he describes bacteria. They were "incredibly small; nay, so small, in my sight, that I judged that even if 100 of these very wee animals lay stretched out one against another, they could not reach the length of a grain of coarse sand." This observation was met first with disbelief, then infectious enthusiasm. The Foldscope will empower latter-day van Leeuwenhoek citizen scientists to act on their curiosity. But could it also have a more immediate and direct impact on global health? 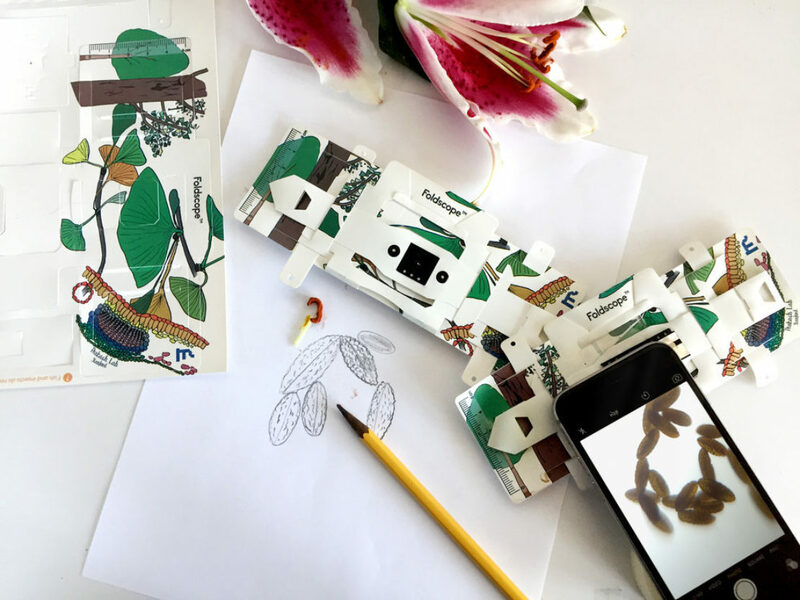 The Foldscope aims to empower citizen scientists. Could it also have an impact on global health? When I spoke to Coyle he had just finished a Skype call with an Iraqi medical student, who wants to use his Foldscope to spot parasites and identify contaminated water sources. In a 2015 research paper the Foldscope showed its potential as a portable tool for diagnosing schistosomiasis (bilharzia) in rural Ghana. Custom-designed Foldscopes can differentiate between the parasite species that cause different types of malaria: a crucial first step to effective treatment. Across the planet too many cases of other treatable disease like tuberculosis, African sleeping sickness, leishmaniasis and giardiasis go undiagnosed. The potential for the cut-price Foldscope to save lives seems vast. But there's a bit more work to do before it will see routine use in the clinic. With the current design the focusing mechansim takes a bit of mastering. Also, the observer's eye ends up very close to the sample. "A bit of a health risk," Coyle acknowledges. These are eminently solvable problems though, and Prakash's Stanford lab is working on them. In the meantime the team is gearing up its effort to provide more tools for what they are calling the 'frugal science' movement. They have just invented the Paperfuge, a high-performance paper centrifuge that costs a mere 20 cents. Prakash, born and raised in a small town in northern India, cares deeply about the Foldscope. "It's hard to work so hard on something unless it really means something to you," says Coyle. "I think that's the best way to explain where he gets the motivation from."